Out of stock - Make a special order? The highest security bicycle chain we offer is this Granit X-Plus City chain. It has a gold sold secure rating and is Thatcham approved. 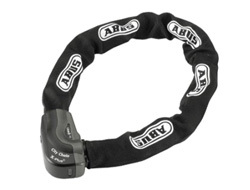 It also incorporates patented ABUS Plus key mechanism which offers the highest protection on the market with over 250,000 key variations and an anti-pick design. 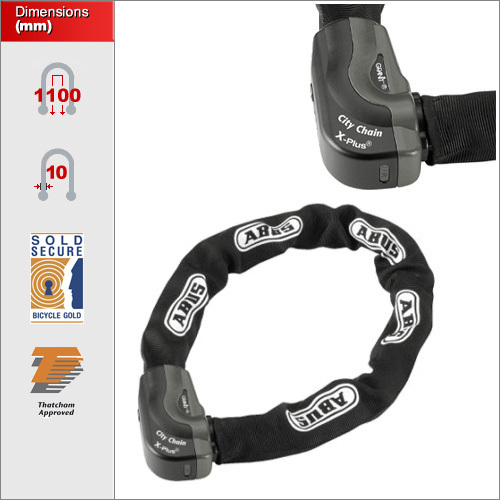 The chain itself is a 10mm hardened steel hexagonal design giving it maximum resistance to attack and includes patented Power Cell Technology. The body of the locking mechanism is also covered in hardened steel. There is only one size in the Granit City Chain which is 110cm long with a 10mm chain link diameter. Insurance approved for bicycles but also a great light-weight option for motorbikes. At 110cm the chain is long enough for locking up to lamp posts, gates, railings and more. We pride ourselves on giving the best advice in the padlock market. If you’re a member of the general public and there’s something we’ve missed on our site, we’d love to hear from you through our FaceBook page or Google Plus pages. Just drop us a line for the “Test The Technical Director Challenge” and if the info you require is not already on our site, we'll reward you with a 15% discount on orders up to £200. Every lock comes with 2 keys each. If you need more then you can add them to your order here. If you are public sector, a school, or have an order over £250 you can submit a purchase order.